We are pleased to have as our keynote speaker Professor Rebecca Futo Kennedy of Denison University. Her keynote address is titled “Suppliants at the Dionysia: Embracing Refugees in an Anti-Immigrant Athens”. Rebecca Futo Kennedy is Associate Professor of Classics with affiliation in Environmental Studies and Women’s and Gender Studies at Denison University and is the Director of the Denison Museum. She received her PhD and MA from The Ohio State University and a BA from the University of Ca at San Diego. Professor Kennedy’s research interests include the intellectual, political, and social history of Classical Athens, Athenian tragedy, and identity formation (both gender & sexuality and race & ethnicity) and immigration in the ancient world. 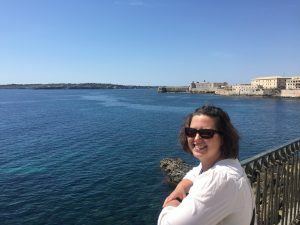 She is the author of “Immigrant Women in Athens: Gender, Ethnicity, and Citizenship in the Classical City” (Routledge, 2014) and editor of “The Companion to the Reception of Aeschylus” (Brill 2018) and the “Handbook to Identity and the Environment in the Classical and Medieval Worlds” (with M. Jones-Lewis; Routledge, 2015). She is a translator and editor (with S. Roy and M. Goldman) of “Race and Ethnicity in the Classical World: An Anthology of Primary Sources” (Hackett, 2013). Her current projects include a book on race and ethnicity in antiquity and its entanglements in modern white supremacy for Johns Hopkins University Press, a new sourcebook of ancient texts on women in ancient Greece and Rome (with Max Goldman for Hackett Press) and chapters on race and ancient history, women in Attic oratory, metics in Athens, and Aeschylus’ Suppliants.